This puzzle I created for the practice of US Puzzle Championship 2009. 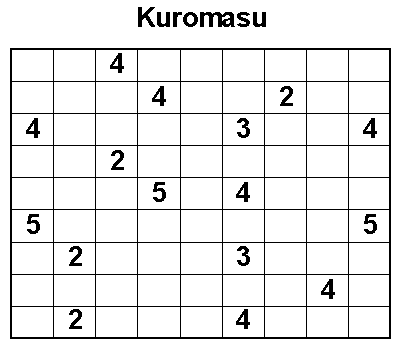 This Kuromasu puzzle is tougher than my previous published Kuromasu puzzles. Now I have got some idea of creating some tough Kuromasu puzzles. Add black squares to the grid (only in the empty spaces) so that each number equals the count of white squares that are directly in line (horizontally and vertically) with that number's square, including the numbered square itself. Black squares cannot share an edge, and all remaining white squares must be connected orthogonally.